Charities across the UK are working to end animal cruelty and promote the well-being of all animals, as well as protect natural habitats. From pets to wild birds, animal welfare charities often provide unique opportunities to volunteer at shelters and nature reserves. There are also a number of opportunities to support their work by sponsoring animals. The following is a list of some of the UK's top animal welfare charities. The Royal Society for the Prevention of Cruelty to Animals (RSPCA) is the UK's leading animal welfare charity. Each year, the organisation rescues, rehabilitates and finds homes for hundreds of thousands of animals. The RSPCA also provides advice on how to care for animals and advocates for legal changes that will better protect animals. It is also involves in the enforcement of animal protection laws. The RSPCA also operates a number of animal rescues. Donations are welcome online, by post, or through direct payments with payroll giving. For more information about donating or volunteering, visit www.rspca.org.uk. The Dogs Trust is the UK's largest dog welfare charity. Founded in 1891 as the National Canine Defence League, its mission is to ensure that all dogs enjoy a happy life that is free from the threat of needless destruction. The Dogs Trust helps approximately 16,000 dogs each year and operates 17 rehoming centres. The charity also leads neutering campaigns in targeted areas where there are stray dog issues, gives classroom presentations in schools, and provides preventative veterinary care for dogs living with homeless people through the Dogs Trust Hope Project. Dogs can also be sponsored through donations starting at £1 a week. For more information, visit www.dogstrust.org.uk . Founded in 1927, Cats Protection has helps over 230,000 felines each year. 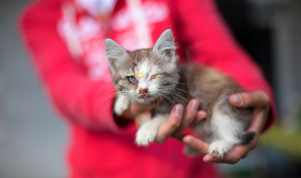 It strives to ensure cats are treated with kindness and that their needs are understood by educating, encouraging neutering, and finding homes for cats. The charity is supported by a network of more than 250 branches, which are all run by volunteers. Cats Protection also operates nearly 30 adoption centres and a homing centre. The charity is involved in extensive public education on neutering and caring for cats through a national helpline and publications. For more information about volunteering, adopting or sponsoring a cat, or providing supporting with a donation, visit www.cats.org.uk. Since the 1960s, Wildlife Trusts have worked to mitigate the destruction of natural habitats in order to preserve the UK's rich natural heritage. There are 47 Wildlife Trusts with over 800,000 members and more than 30,000 volunteers. Each year, these voluntary organisations work with schools to promote habitat protection. Wildlife Trusts also work with landowners and businesses to recover habitats and ecosystems, including marine habitats. Local trusts also operate over 2,000 nature reserves and visitors centres. To find a local trust or to donate to a local appeal, visit www.wildlifetrusts.org. The Royal Society for the Protection of Birds (RSPB) works to protect birds and their habitats. The charity has over a million members and some 18,000 volunteers. The RSPB also operates 200 nature reserves, many of which are home to the UK's rarest and most threatened birds. Volunteers can get involved with one of 175 local groups and over 110 youth groups. For more information about volunteering or donating, visit www.rspb.org.uk . Promoting Businesses Helping Their Communities, Prime Office Space helps companies find business accommodation throughout London and the UK. View the available space online or call 0800 1444 888 to speak to our expert consultants.